This is a really nice set of expertly designed and cast resin hedgerow cutters. Labeled as "Type 2", they differ from FBMini's Type 1 set. As you can see, there are two pieces, one each of two similar designs. 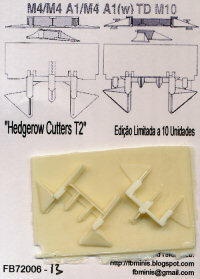 I think that the large, triangular blades on the sides are what makes these "Type 2" cutters. Although labeled for Shermans and M10s, I think these were also used on M3/5 Stuarts, thought the mounting points may need to be modified to fit the smaller tanks. There are a couple of minor pinholes in the resin, but nothing that is too hard to fix. This set is "Limited Edition", so I'm unsure if they are still available. Grab 'em while you can.